Are You Looking For Soup Recipes? One of my most fave things about our blog community is how we can share ideas and RECIPES with each other! I always enjoy your recipes, especially the soup one. I LOVE soup!! I have been making the one with a Progresso Light Chicken Dumpling soup can, chicken, milk, goat cheese, etc. - you know which one I am talking about? 45 g of Protein and about 14 WW Plus points for the whole thing. I ate half for lunch and half for dinner. This one also has a ton of protein. I didn't keep the can, but I guess it to be around 60 g of Protein for the whole thing. Anyway, I hope you'll have a chance to try these. They are so quick and easy to make, which is a MUST for me. Lost 75 lbs - at goal at 163 lbs and maintaining - yeah!!!! Do you have a any recipes that you would like to share? Post your link and recipes below! I can't wait to read them and give 'em a try. **Not her real name -- I keep all emails that I receive from you all confidential. Did you see my weigh-in numbers on Facebook? I even included a Friday Flashback photo from my surgery day. Would You Like a Tasty Donut? I would like three donuts actually. On Friday at work, I heard the announcement from the break room: "Krispy Kreme donuts you guys!" My second thought: "Wait! Look it up first"
Before I could jump up from my chair and run/walk to the breakroom, I went onto Krispy Kreme's website to look up the plain glazed donut that I knew I would eat. Just to double check real quick. Just to be super sure of what I was about to do. Phew! I was relieved to see that a glazed donut is: 190 cals, 2 proteins. That calorie count is totally in my "Weight Maintenance" lifestyle for a special once-a-week type of treat. But then I scrolled down to read a few nutrition facts of the other items on the menu at Krispy Kreme. 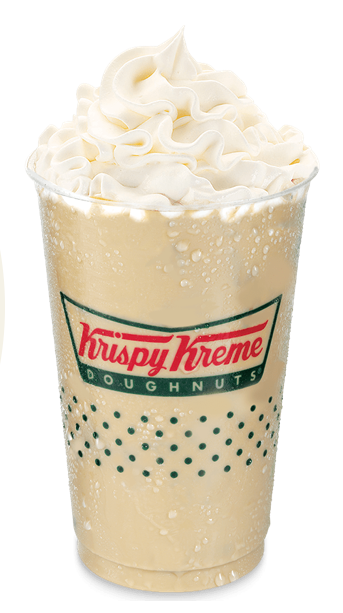 Mocha Dream Chiller. A 20 oz drink. Guess how many calories and proteins are in this drink? That drink would go. right. past. my. Lap-Band. No problemo. So, I ate that donut on Friday morning. And I knew EXACTLY what I was getting into. Or maybe my scale is broken. Or perhaps it's time for new batteries. What was today's weigh-in when I stood on the scale? I saw everything from 141.4 lbs to 143.6 lbs. But I consider it a "win" because I'm still below my weight of 145 lbs. I will put in new batteries in my scale and let ya know. I've been doing these weekly Friday weigh-ins now for OVER 4 1/2 YEARS.